At a U.S. Senate Commerce subcommittee hearing on Wednesday, the Federal Aviation Administration (FAA) acting head Dan Elwell will say the agency's oversight approach must "evolve" after the deadly crashes, according to the testimony. Anti-stall software on the Boeing 737 MAX plane is among the leading areas of focus for investigations into the two crashes. Investigators have pointed to "clear similarities" between the crashes, putting pressure on Boeing and U.S. regulators to come up with an adequate fix. The aviation industry has been thrown into flux by a Lion Air crash in Indonesia last October that killed 189 people and an Ethiopian Airlines disaster on March 10 that killed 157, both involving Boeing's 737 MAX single-aisle plane. A spokesman for Ethiopia's transport ministry, which is leading an investigation in Addis Ababa, said the preliminary crash report would very likely be released this week. Boeing's fastest-selling 737 MAX jet, with orders worth more than $500 billion at list prices, has been grounded globally by the FAA, although airlines are still allowed to fly them without passengers to move planes to other airports. Elwell's testimony discloses that Boeing first submitted a proposed upgrade to its anti-stall software - the Maneuvering Characteristics Augmentation System, known as MCAS - to the FAA for certification on Jan. 21. "We're also very interested in any changes to the FAA's structure and certification process that would ensure that never again would a critical system like MCAS not be transparent to pilots," the association said in a statement, highlighting some pilots' concerns that they had been unaware of the existence of MCAS on MAX aircraft they were flying. Chief Executive Dennis Muilenburg visited Boeing's Seattle-area facilities on Tuesday and attended at least one all-hands meeting with engineers, two people familiar with the matter said. 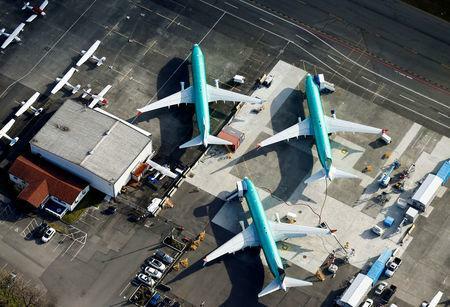 Boeing's software fix for the 737 MAX will prevent repeated operation of the anti-stall system and deactivate it altogether if two sensors disagree widely, two people familiar with pilot briefings told Reuters on Monday. Upgrading an individual 737 MAX with Boeing's new software only takes about an hour per plane, though the overall process could stretch on far longer as it is rolled out across the global fleet because of stringent testing and documentation requirements by engineers and regulators, according to a senior FAA official with knowledge of the process. Representative Peter DeFazio, who chairs the U.S. House of Representatives Transportation and Infrastructure Committee, sent a letter on Tuesday to the FAA, asking it to hold an independent, third-party review of Boeing's proposed changes to the 737 MAX before it is returned to service.